As most of you are already aware, Olivia and Carter helped create our week-long “Plastic Awareness Week” curriculum for elementary schools. Their goal is to raise awareness to the issue of Plastic Pollution and to reach out to every elementary student inthe country so they too can start being the solution to the problem. Recently we had the opportunity to present our program to the extremely talented students from the SKA Academy of Art and Design School in Duluth GA. Co-founder of the school Dr. Leng Chee Chang (who is a Graduated with Ph.D. Degree in Pharmacognosy from University of Illinois at Chicago) heard about our program and invited Olivia and Carter to come and teach to several of their classes over the course of several weeks.As usual, Olivia and Carter were quick to jump at the opportunity to meet with kids their own age and to help them understand how important it is to try and cut down on the amount of Plastic Trash we add to our environment each day. 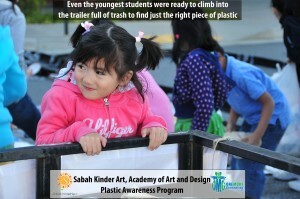 We again set up our trailer in the front of the art school and asked all the students to bring in all their plastic trash from home each day. 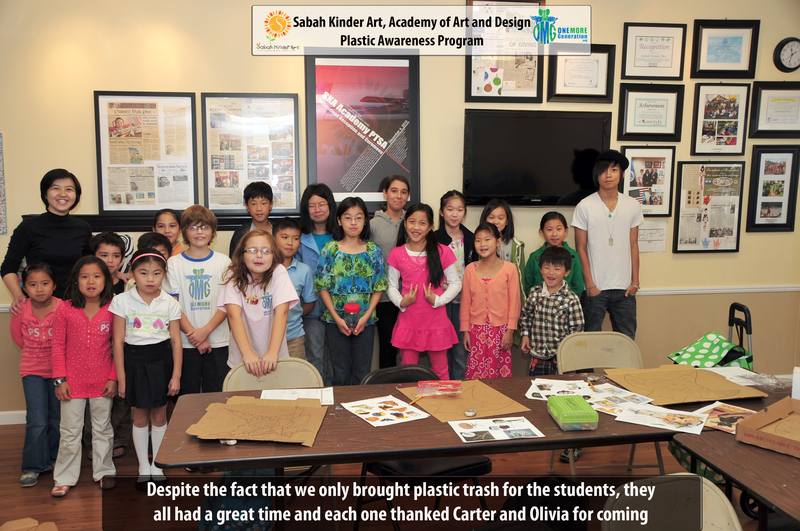 Then Olivia and Carter proceeded to teach the kids about the different types of plastic and and help them understand which plastics are more readily recyclable and which ones should be avoided since they were not easily recycled in most communities. I don’t know who likes doing this more, Olivia or Carter but I do know they get a kick out of the reaction from the kids as they learn about all the different types of plastic. Next we teach the kids the basic facts about our consumption of single use shopping bags and water bottles and help them understand the impact plastic trash has on our environment and on animals. We provide them with hand-outs they all take home to share with their families and also give them simple easy to use steps which will allow them to start making an immediate difference at home. 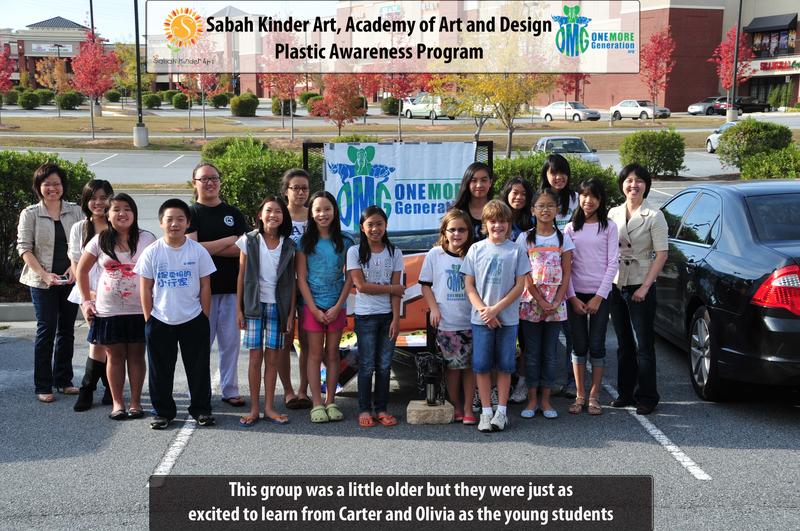 The kids all seem to love learning about the issue and we are always amazed at how involved the students get with our program. During the course of several weeks the students of the art school also took on the responsibility of creating their own 3-D art sculpture made entirely of plastic trash they collected. The goal was to use the opportunity to allow the students to explore and express their thoughts about the facts they learned and to use the opportunity to raise awareness to their classmates and families about the issue. 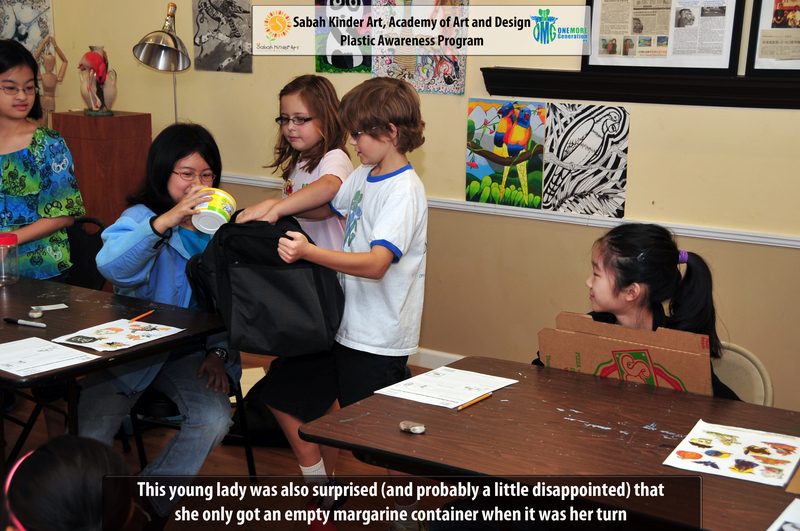 Each class consisted of varying ages and it was exciting to see their sincere concern as they learned the startling facts about the amounts of plastic pollution we generate here in America and to realize how much each one of them also contributed to the issue. 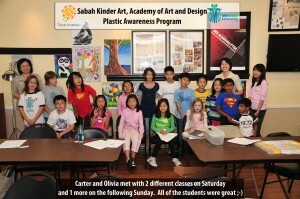 The students were all very attentive and it was a sincere pleasure working with them all. Olivia told me that she really likes teaching kids about the issues because she can really see that they get-it. 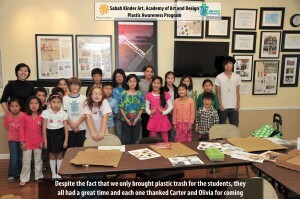 Carter likes the looks on their faces as the students learn both the good and the bad facts about plastic pollution and he especially likes hearing the conviction in their voices as they excitedly explain that they are going to go home and tell their parents what they had learned. 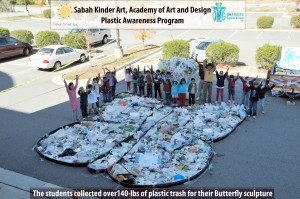 Next we got to my favorite part of our program, that is where all the kids (and even their parents) get to go outside and take all the plastic trash they collected over the course of the week to create an art sculpture/design. 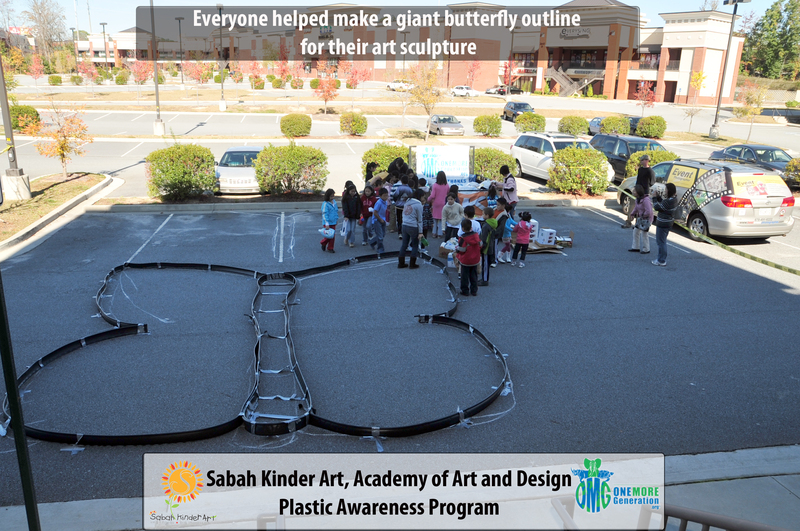 The goal of the art sculpture is to allow the students a way to express to the community what they have learned and to use their art and creativity to send a message which will help their community understand the importance of everyone getting involved. The start of the art sculpture always seems daunting to me (partially because I have zero artistic capabilities and I have a hard time even drawing a stick person) but as the kids start getting involved it always seems to flow so smoothly. I love to watch their reaction as they collectively start filling their design with trash. Who could have ever suspected that playing with real trash could be so much fun? Then, little by little the design starts to take shape and you can here the excitement and satisfaction in the kids as they are nearing the completion of their work. Each one is thoroughly excited about being part of the process and the looks on their faces as their parents show up is priceless. 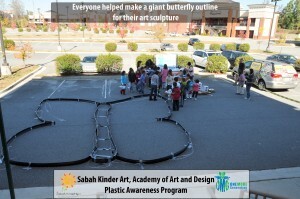 When the art sculpture is completed, all the kids gather around and chatter among themselves in excitement about what they have created. And just when they think the event is coming to an end, that’s when we introduce the dreaded OMG Bag Monster. Their screams of surprise and joy are probably the most enjoyable part of the entire event. 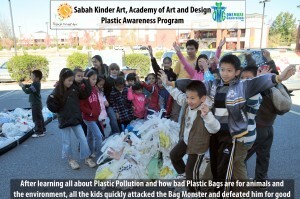 One by one they gather around to hear what the Bag Monster has to say and just as quickly as the Bag Monster tries to seek support for the continued use of endless plastic bags, all the kids join in harmoniously vowing to end his reign in their community. Even the parents get involved as they too show solidarity with their children. 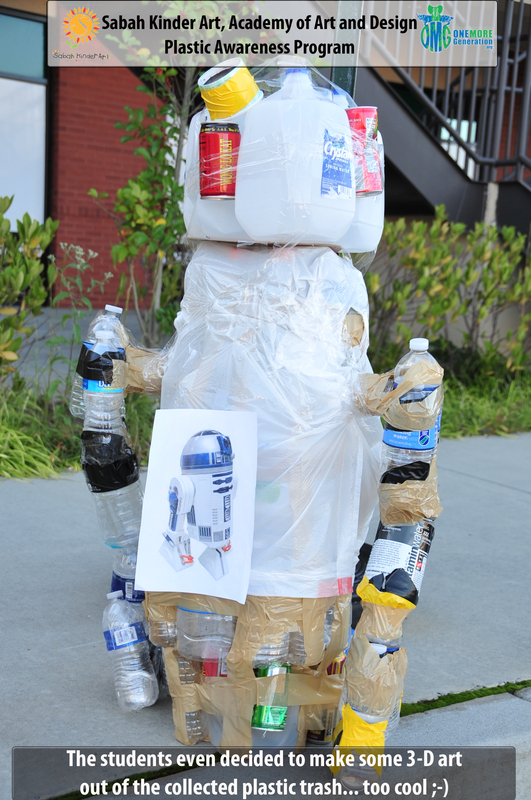 When it all over, the Bag Monster is defeated and the art sculpture is complete. Sending a loud and definitive message throughout the community that these kids are making the first steps to being the solution. You can see all the amazing pictures from the event and all of the creative drawings the kids made of the OMG Bag Monster on our FaceBook page. 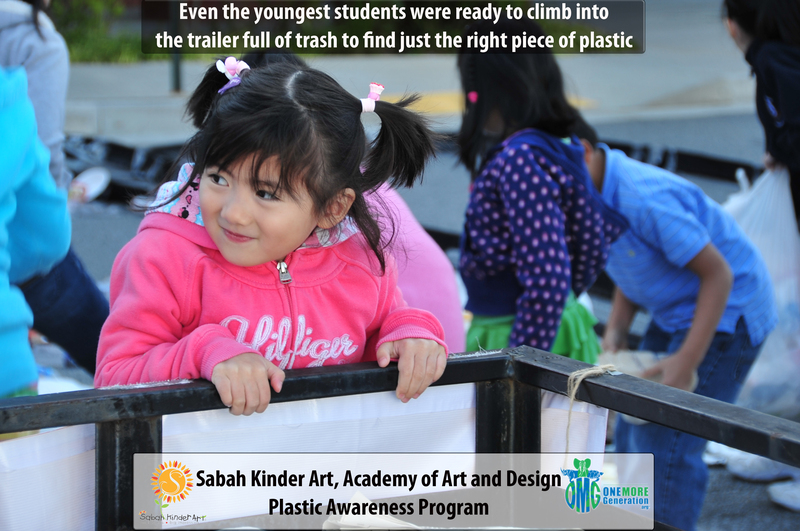 If you would like to have OMG come and teach your students about Plastic Pollution and how they too can be the solution, just send us an email and we will gladly contact you to schedule the event. We wish to thank everyone at the SKA Academy of Art and Design for their support with this project and for making the event such a huge success.